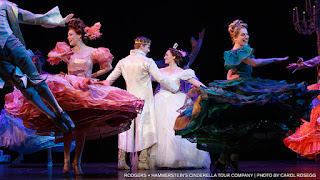 Finding your happy ending is a pursuit that almost everyone, young and old can relate to and so, too, will theatergoers of all ages find something they can enjoy about the current touring version of “Rodgers + Hammerstein’s Cinderella”. Douglas Carter Beane updated the script in 2013 for (can you believe?) the show’s first Broadway run. Going back to the fairytale’s original French roots to avoid comparisons to a certain film version, he found details that flesh out both the Prince and his kingdom and how they both benefit from Ella’s kindness. Impressive technical achievements abound. The scenic design of Anna Louizos is colorful, practical, and fluid, especially in the opening forest-set number, “Me, Who I Am.” From small cottages, to spectacular staircases, the scenery enhances every aspect of the show. The costume design of William Ivey Long goes far beyond the practicality of helping create characters; they practically become characters themselves, as they take on life changing roles of their own. The score, by the indubitable duo of Richard Rodgers and Oscar Hammerstein II, includes tender ballads such as “In My Own Little Cottage,” the classic “Impossible” and rousing productions such as “The Prince is Giving a Ball”. This last number was highlighted by spectacular choreography and strong, physical dancing by the company. The ball, too, featured a youthful exuberance one would not expect in such a formal setting. With the surprisingly contemporary take giving his Prince more depth, (including a real name: Topher), Andy Huntington Jones cuts a dashing figure, with a fine voice and kind heart. Of course, the show is nothing without the right Cinderella, and Kaitlyn Davidson is the complete princess package, with a winning smile, lilting voice, and endearing presence. Each supporting character lends a little magic to the proceedings, especially Kimberly Faure as one of the not really so evil stepsisters and the enchanting fairy godmother played by Liz McCartney. With every aspect of the show exhibiting a touch of stage magic, this production of “Rodgers + Hammerstein’s Cinderella” is, as the song suggests, “ A Lovely Night” of musical theatre.